I don’t have children yet, but when I do, I know I’m going to want to make sure they’re intelligent, creative, compassionate, and self-confident—probably what every non-parent hopes for, right? Wishful thinking aside, I do still want to raise children who feel the world is their oyster. I don’t want to bring up ruthless little businessmen that hike drug prices 5,000 percent, but people more like Blake Mycoskie and Sanjit “Bunker” Roy who temper business smarts with a whole lot of compassion. Beyond a good education and brilliant parenting skills, how do I raise little entrepreneurs? Better yet, what does it even take to become a great entrepreneur? Luckily I didn’t have to get out there and do the research myself. According to a recent Gallup survey of over 2,500 entrepreneurs, there are 10 talents you’ll find common among them. And, given it’s the holiday season, I decided to go about presenting the data in a slightly more entertaining manner. If you’re going to raise a little entrepreneur (do-gooder activities aside), you’re going to need to make your child aware that being in business means turning a profit, and that means making decisions that impact the bottom line. Here are some games that make this pretty clear. 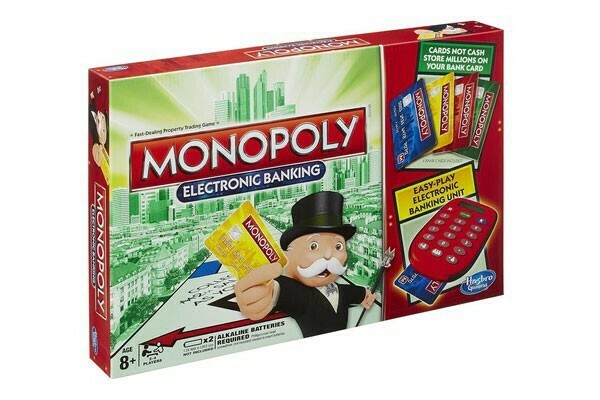 Toy company Hasbro knows cash is “oh so yesterday.” With Monopoly Electronic Banking, Monopoly just got a mega update and a whole lot cooler. Collect rent, pay fines, and buy property using bank cards and a clever electronic unit that mimics a real card reader device. If you already own Monopoly and don’t want to buy yet another version of the game, give PayDay a try. 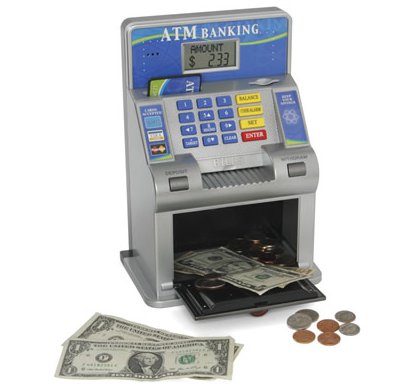 According to the Hammacher Schlemmer Institute, this ATM toy is the best one out there to teach children money management skills. It allows them to deposit real coins and bills and displays the data on a screen. It even comes with an ATM card and a pin so they can check their account balance, make deposits, and withdraw funds. If you’re looking for presents for younger children, you may want to try something a little simpler. 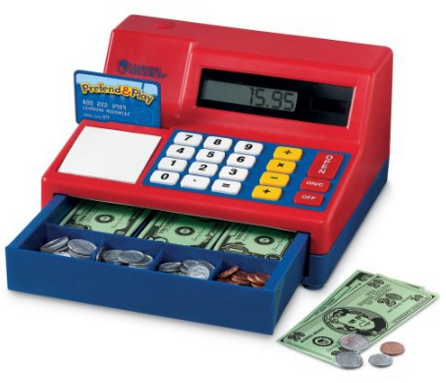 This cash register is a bestseller on Amazon. This talent is pretty much a given for success in any format, be that business, athletics, or arts. Confidence gives you the ability to get out there and change the world, to do the things you dream in spite of what the world thinks is possible. A great way to select toys that build confidence is to pick ones that offer up a challenge to begin with, but that aren’t inherently possible to do, play, or solve. For me, toys like the Rubik’s Cube were disheartening, but puzzles and games that required creative thinking and reasoning? Bring it on. 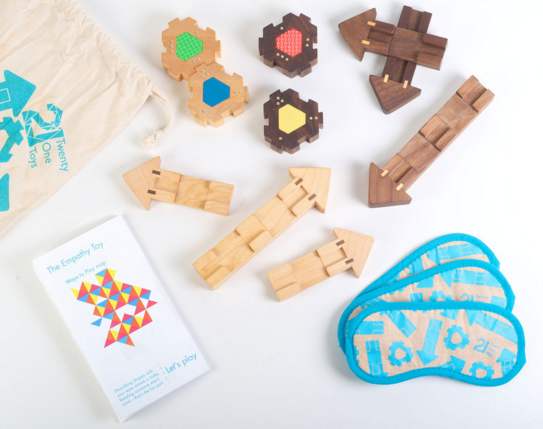 These aren’t your traditional “puzzle toys” but brain teasers that are going to keep your children thinking and captivated. 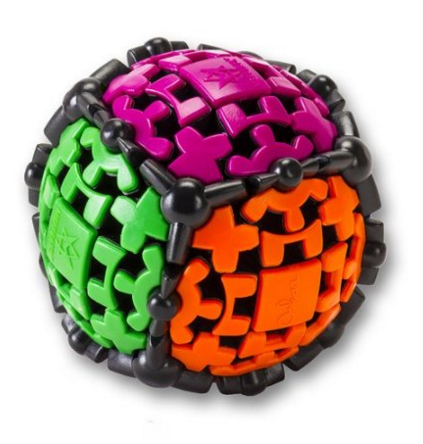 A couple of quick, cool facts: The Mefferts Gearball Brainteaser Puzzle was developed by one of the world’s leading puzzle inventors, Uwe Mèffert (it’ll pack a punch), and IQ Fit has 120 challenges, so think again about getting bored. When they’ve mastered these puzzles you can move them onto slightly more challenging toys to keep their confidence growing. When the time is right, try the Megaminx Puzzle Cube (the Rubik’s Cube should definitely come first), the ThinkFun Gordians Knot, Brainstring Advanced, Educational Insights Kanoodle Genius, and the IcoSoKu Brainteaser Puzzle. 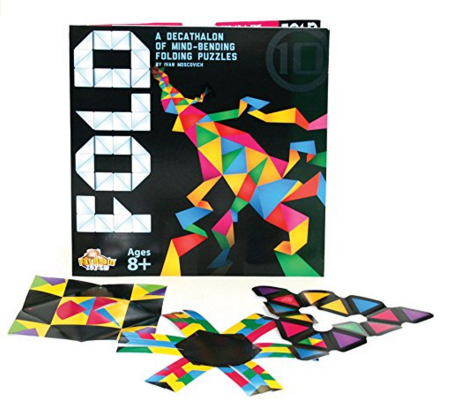 A “decathlon of mind-bending folding puzzles,” Fold will keep your kids endlessly entertained, especially if they love origami. It’s not impossible by any means, but it’s a tough challenge of twists and turns, with a whole lot of satisfaction as the reward. It’s as much a test of will, patience, and logic as it is a great way to build confidence in problem-solving abilities. And if you think there’s no future application for this skill, think again—check out Robert Lang’s incredible origami art. There’s a new trend in toy design and it’s probably one of the most important in decades: STEM toys are designed to encourage children’s interest in the science, technology, engineering, and mathematics. 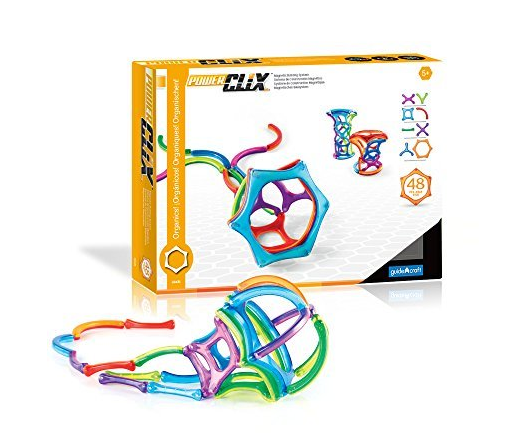 Guidecraft Power Clix is a magnetic building toy system that comprises colorful plastic shapes that fit together with the easy click of a magnet. 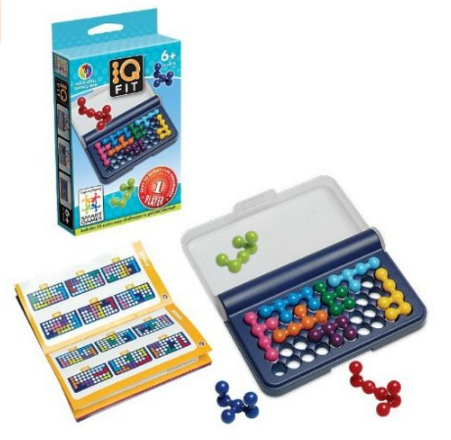 This is a great kit to help both boys and girls develop spatial thinking skills and fine motor skills. It’s also a toy commonly used to help children with special needs and will be a good confidence booster for anyone interested in the sciences. Picking just one of the Guidecraft packages was tough. In the end, I opted for this one because it’s inspired by shapes found in nature. It does still work with the other PowerClix systems, so can be mix and matched. For the outdoor explorers and nature lovers, I’d go with the Dr. 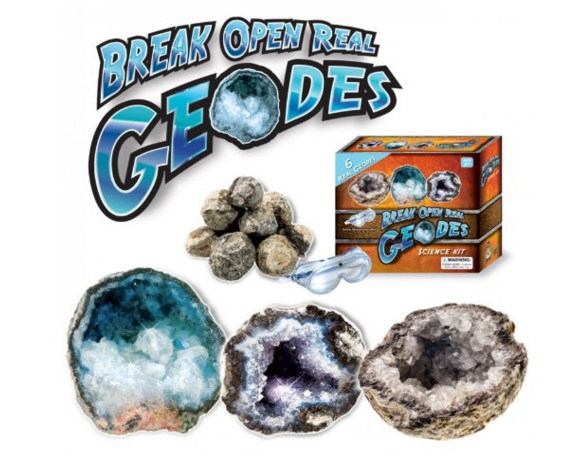 Cool Explorer Geode Science Kit, the BugWatch Boxed Set, Roominate, the Thames & Cosmos Crystal Growing Kit, and the Educational Insights GeoSafari Microscope. These are all toys for slightly younger children. 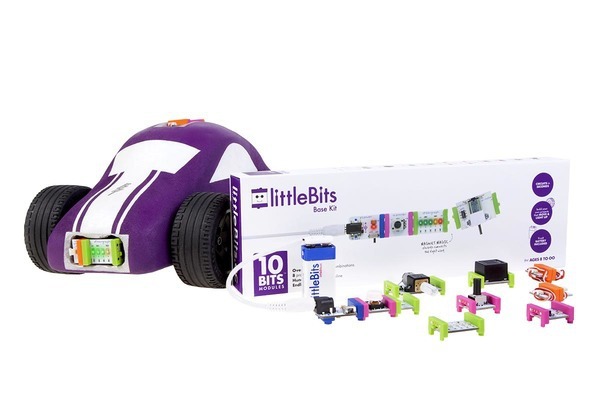 If you’re looking for toys in this category more appropriate to slightly older children, check out littleBits (this one’s supposed to be “age-agnostic”), Snap Circuits Lights Electronics Discovery Kit, Science Wiz: Chemistry Plus Experiment Kit, the Educational Insights Micropro Microscope Set, and the Science Wiz: Inventions Kit (don’t forget to also check out the Science Wiz chemistry, magnetism, light, and electricity kits—they’re all awesome!). I may go as far as to say that creativity and creative thinking are of paramount importance to any entrepreneurial venture. Even if you’re not in product design, you exhibit creativity in taking an existing idea or product and turning it into something better. No household is complete without this game, and I don’t just say it as a writer. 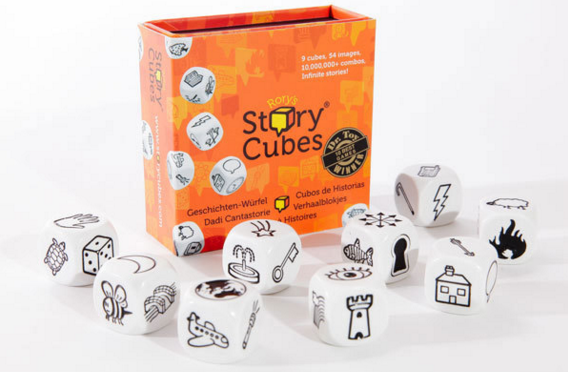 Rory’s Story Cubes is a fun dice game with limitless storytelling opportunities. It’s also affordable and has plenty of expansion packs so you can keep the fun coming over time. If your kid is a fan of Marvel comics, try the Batman Action Game version! There’s even a great page on the company’s site that gives you ideas on how to play. Watch a few of the videos and then get involved in the creative gameplay with your son or daughter—you’re bound to have as much fun as them! 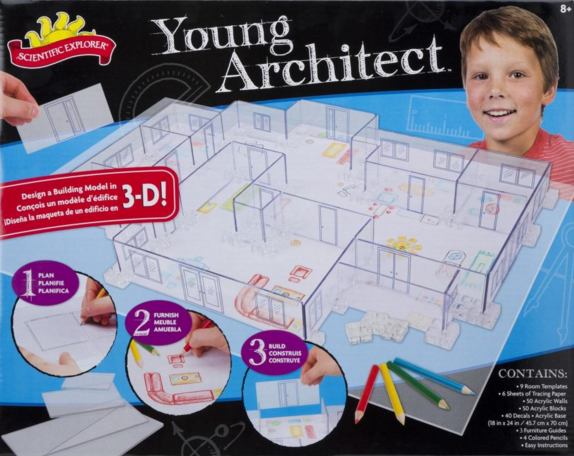 The best thing about this 3D Young Architect Building kit is that it’s reusable. It includes room templates, tracing paper, an acrylic base, acrylic walls, acrylic blocks, 40 stick-and-peel decals, furniture guides, and colored pencils. It’s a whole lot of fun in just one box. 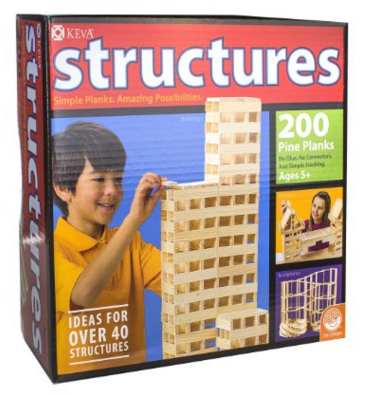 If they like this toy, check out the Structures 200 Plank Set. Also, the Home Quick Planner: Reusable, Peel and Stick Furniture and Architectural Symbols book (I loved peel and stick books as a kid, and I’m a self-professed creative disaster) and the Doodle, Design, and Draw Dream Rooms book. If architecture isn’t your kid’s “thing,” Scientific Explorer has a number of other similar creative toys and games. If you’ve got this skill, you’re able to recognize that you can’t do everything yourself. Even if you can, in order to grow, accomplish more, or do something else better, you need to be willing and able to contemplate a shift in style and control. The Empathy Toy is so new you’re not going to find it on most lists or possibly even in most shops. That said, it has had fantastic press on TEDx and elsewhere with FastCompany naming it the best kids’ toy of 2014. What is it? Simply put, it’s a puzzle game that can only be solved when players learn to understand each other. The only drawback is the price tag which comes in at $96.80 for the home kit. To help children become determined, they will need to persevere through difficult—even seemingly insurmountable—obstacles. In my opinion, there’s nothing quite like sports to teach this skill so, if you’re looking for toys in this realm, there are a number you could choose between. There’s nothing quite like picking a target and going for it time and time again. The Zing Air Hunterz Z-Curve Bow is designed with safety in mind and includes arrows made of soft foam. With over 1,000 reviews on Amazon and an average review rating of 4.5, you’re making a good choice. For children over the age of 14, you can probably start venturing into the realm of a “real archery set” like the Barnett Outdoors Lil Banshee Jr. 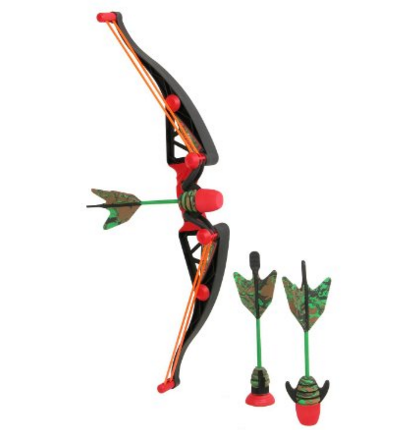 Compound Youth Archery Set. 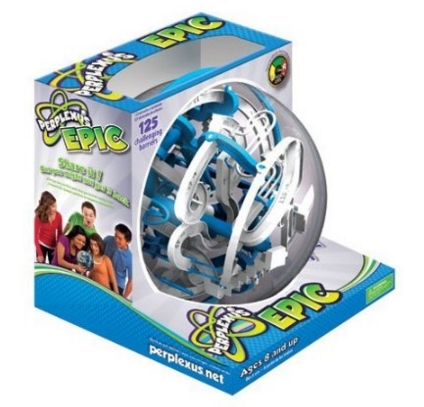 A non-sporty toy, the Perplexus Epic will keep your son or daughter entertained for hours. If this one doesn’t foster determination, I truly don’t know what will. 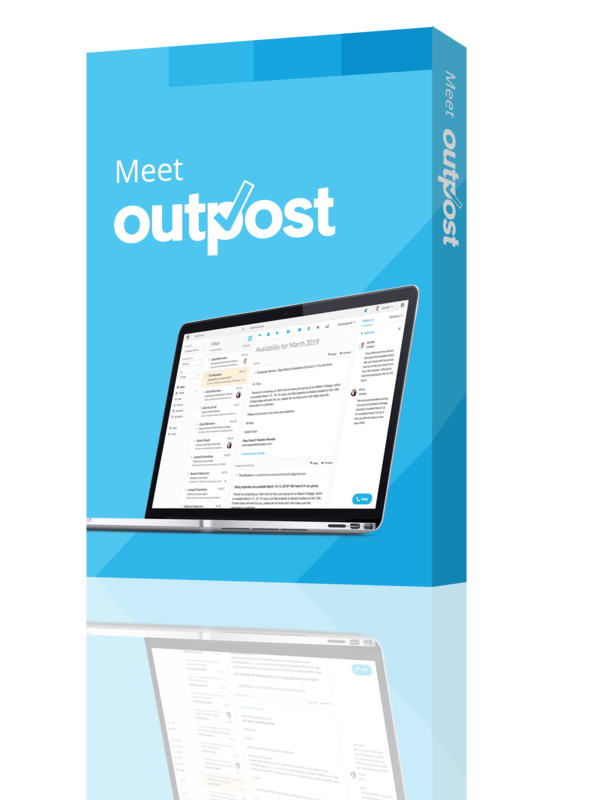 Independent thinking is an invaluable asset in the business world, as it helps you do whatever it is that needs doing in order to build a successful venture. It also increases the likelihood that you’ll do something new, something out-of-the-box that no one has yet heard of. When I was young, I was an inventor. I re-envisioned laptops, I built paper cameras, and I crafted clocks made from old coffee cans. Here’s a toy I wish I’d had as a kid. 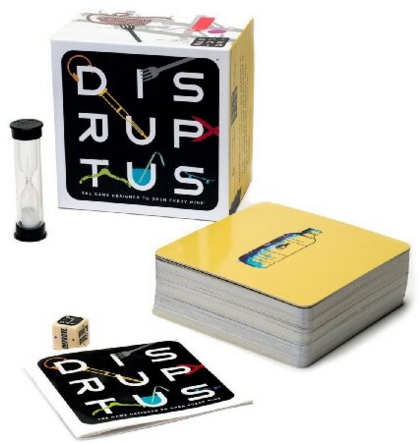 The Disruptus encourages players to look at objects and ideas and to innovate. It brands itself as “the game designed to open every mind” and is truly an allusion to the “disruptive thinking” model. Don’t know much about disruptive strategies? Watch this video. Anyone that plans to go into business is going to need to be naturally curious and hungry for knowledge. Encouraging this talent simply requires instilling a love for learning. Given the number of incredible toys available today, picking just a few for this section was hard. If you want to browse a broader list, do a Google search for STEM toys, or check out a museum shop. Ultimately, you are the best spokesperson for your own business. Encouraging your children to promote their own skills and talents can go a long way to not only building their confidence but to teaching them something that will become invaluable later on—the ability to market yourself or your business. According to researchers, children are wired to love entrepreneurship, mainly because running a business requires creativity, autonomy, and making steady progress toward a goal, something that comes more naturally when you’re younger. Here’s the traditional way to learn business skills like self-promotion, the one we all know well—the lemonade stand! 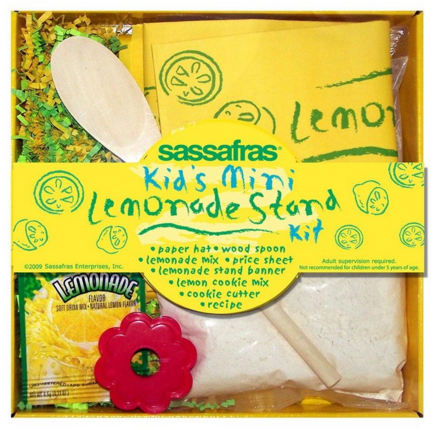 This lemonade stand kit includes lemonade mix, sugar cookie mix, a cookie cutter, a wooden spoon, a paper hat, a price sheet, a paper banner, recipe, and instructions. It’s all business from here. If you can’t take risks, you probably haven’t got what it takes to be an entrepreneur. 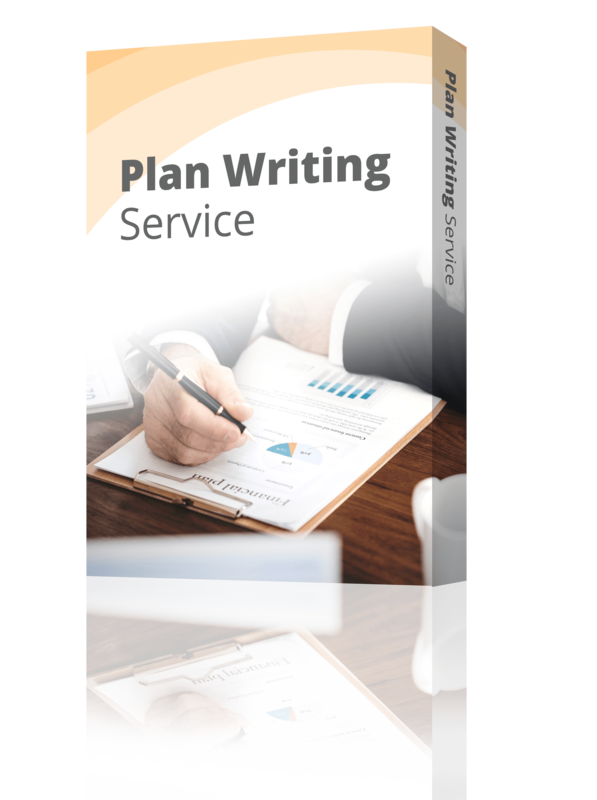 Naturally, this doesn’t mean rushing headlong into doing the untried and untested, but rather, making careful, informed decisions that are likely to result in success but that could also mean failure. When you look at it this way, raising a risk-taker might not be the worst thing imaginable. So, before you scold your child for doing something that you know is probably going to result in an accident, think about whether or not the thing they’re doing—accidents aside—will help them to develop a beneficial skill. While a unicycle isn’t classically considered a toy (or a stocking stuffer), it’s still a gift worth considering. I’ve been deeply embedded in the world of unicycling for the last few years and can attest to the fact that anyone can learn to do it, but that it’s a whole lot easier when you’re young. 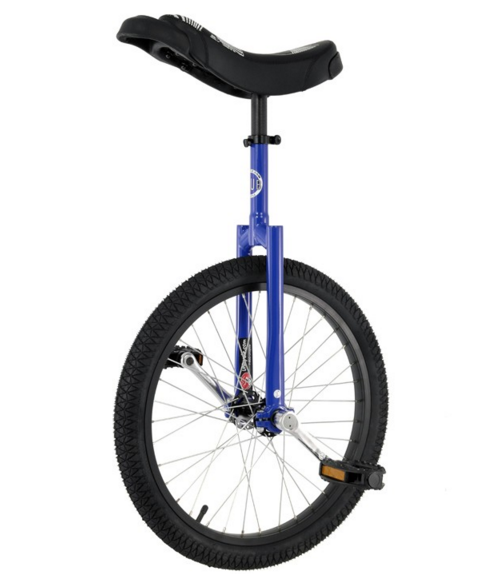 Not only will a unicycle encourage your child to take risks, but it will teach balance, diligence, and patience. When they’ve mastered the unicycle, you can move them onto the Ultimate Wheel. Look through the unicycles on unicycle.com for more! 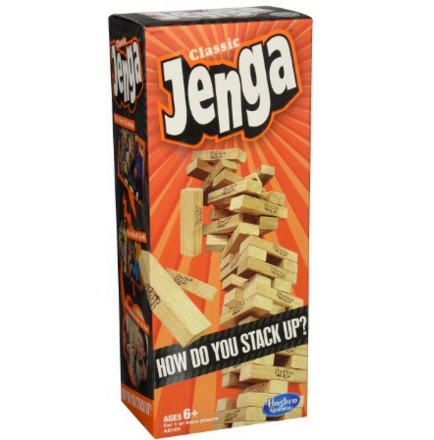 And, even if it doesn’t say it on the box, Jenga is the classic game of risk. Every move you make brings you closer to the possibility of failure, and knowing that is surprisingly thrilling! Take this game to the next level with giant Jenga, though be warned—it’s loud. If you’re thinking along the lines of simple stocking stuffers, you truly can’t go wrong with a pack of playing cards and instructions on how to play risk-taking games like Speed or BS. 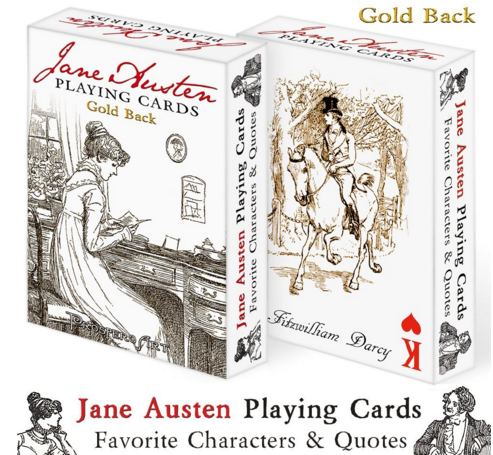 Personally, I love the Giant Jumbo playing cards, the Jane Austen playing cards, and the Alice in Wonderland playing cards on Amazon. Help your child become a skilled relationship-builder by getting them invested in learning communication skills. 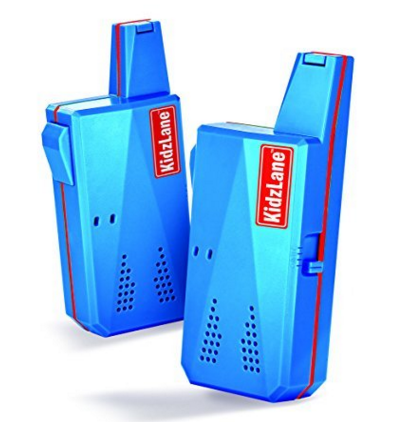 When I was growing up, walkie talkies didn’t have the two mile range that this walkie talkie does, and they certainly weren’t as small as this one. It’s a great beginner’s toy that feels serious. For the older child, try something real like the Motorola MH230TPR, which has an incredible 23 mile range in good conditions, including hands-free communication as well—and this three-pack could be fun for the whole family. Toys might be the new textbooks for some, but real books will hopefully never die. Beyond teaching literacy, teaching your children to love reading from an early age is also a great way to teach them to love learning, to teach them to put themselves in others’ shoes, and to teach them to be curious individuals. You might not think of the American Federal Reserve as the place to go for comic books, but they’ve been teaching money management for years via their own series of comics, which you can access for free on the Internet Archive. And, if you’re raising a little lawyer, try The Illustrated Book of Bad Arguments. For encouraging curiosity and a love of learning, try Thing Explainer: Complicated Stuff in Simple Words. The Little Prince is one book you’ll find on most reading lists for children, but it’s also a book most adults enjoy. Here’s a beautiful new pop-up version of a story designed to encourage children (and adults) to follow their heart in order to find true fulfillment. Love Dr Seuss? Give One Cent, Two Cents, Old Cent, New Cent a try. It’s not written by Theodor Seuss Geisel, the original writer and illustrator of beloved books in this series, but it’s still a Cat in the Hat book and is packed full of great life lessons. If you’re looking for something for readers ages 7 and below, try The Berenstain Bears’ Trouble With Money. Note: I thought about including a section on apps and software gifts for children when I came across the very cool Bite Club game (think vampires and financial management), but after much deliberation, decided not to. Ultimately, kids are going to spend a whole lot of time in front of the screen later on, so why rush it? Build those other skills, especially people skills, and they can get to screen time later. What is your favorite toy that helps build a useful skill? Do you plan on buying any of these toys for the budding entrepreneur in your life? Let us know on Facebook or Twitter!